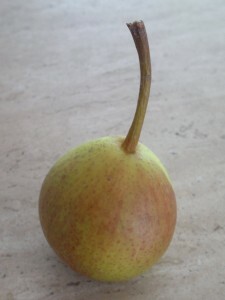 The Doyenne d’Ete, or summer doyenne, is an old variety of early summer pear. While we have many weeks yet before the main pear crop begins, this early pear is generally ripe around mid July to the end of August. Like the early apples, these sorts of pear are not the finest in quality nor do they last long. Doyenne d’Ete keeps but a day or two once ripe before the texture and flavour deteriorate. In good condition, though, it is a nice little pear. In modern times, foreign imports have replaced the early varieties of apple and pear, which are now rarely seen. This is a pity, because if one is following seasonal produce, there is much to look forward to in that first locally grown apple or pear of the year. Perhaps because of the very winter and mild spring, our Doyenne d’Ete pears were developing a little more quickly than expected. Some days ago, we noticed a small amount of bird damage on one or two of the fruits. This variety bears profusely so we did not worry too much about the loss of a few of them. A couple of days later, though, and a significant portion of the fruit had been damaged or eaten entirely. Although we have not needed to in the past, I decided to net the remaining fruit. I thought I had done quite a good job of it, but the next morning when I went to feed the chickens, I found one of the culprits had somehow penetrated the defences and was having breakfast on our account. It would have been nice to allow the fruit to develop for another week or so, but I decided to harvest what remained. This was not such a problem, as pears are, in fact, best harvested when green and ripened indoors. If left to ripen on the tree both the texture and flavour suffer. After a couple of days they are beginning to ripen. Doyenne d’Ete is not only remarkable for its earliness in the season but also for its very small size. The fruits are, perhaps, 1½ to 1¾ inches in diameter and around 1¾ inches in height and slightly turbinate. 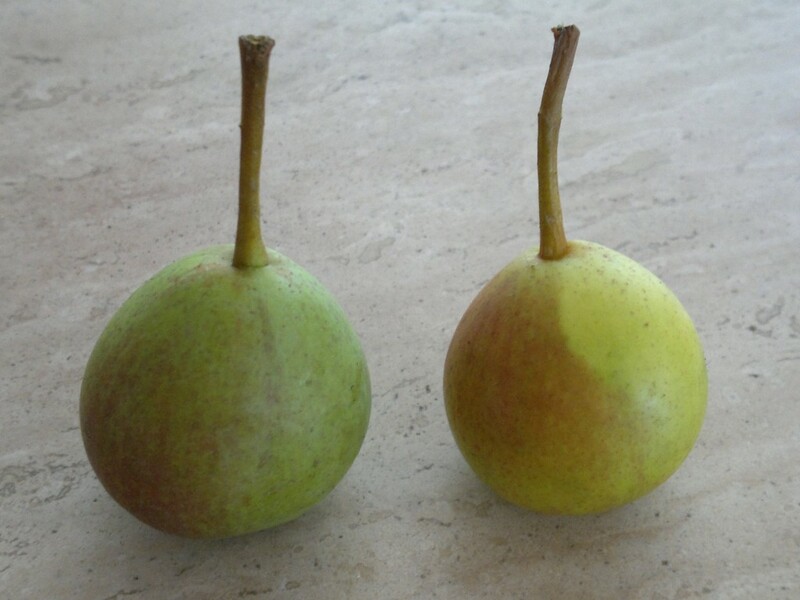 In their unripe state the skin is a pale to mid green with some dull flushing on the sun side. When ripe, the green mellows to warm yellow and the dull flushing to crimson. They are perfectly ripe when there remains just a hint of green about the skin. Although early fruits never quite achieve the fine qualities of later varieties, the flavour and texture are very pleasant, with plenty of juice and a good balance. Doyenne d’Ete was raised in the early 1800s by Jean-Baptiste Van Mons, a prolific breeder of improved varieties of pear from perhaps the most important period in this fruit’s development. When selecting choice varieties for our cordons and orchard trees, we ended up with several others from Van Mons: Beurre Diel, named after August Friedrich Adrian Diel, a German pomologist of the same era, Easter Beurre, which he propagated from the original tree in the garden of a monastery in Leuven, and Beurre d’Anjou. The latter, although not grown to any extent in this country, is of commercial importance in the U.S., along with the so called Bartlett pear, which we know better as Williams Bonchrétien, and Beurre Bosc, yet another variety from Van Mons. There is no doubt that Van Mons had a substantial impact on the cultivation of pears, and to the reputation of those Flemish sorts famed for their melting textures. Doyenne d’Ete may not be quite so fine as later varieties, but it is a very nice pear, and a real treat at this time of year. Like the early apples, it would be hard to recommend if only growing a couple of trees, but even quite modest gardens have space for a row of cordons, where it would bear well and serve a useful purpose. 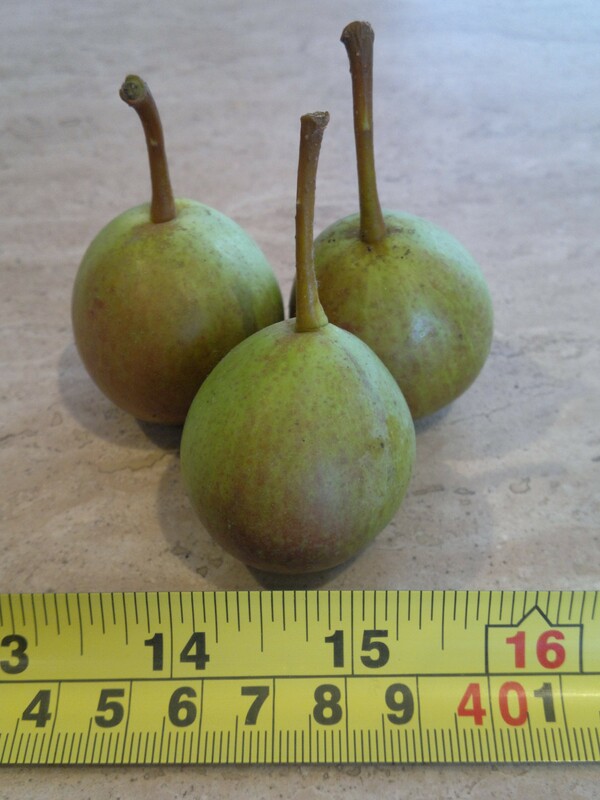 This entry was posted in Garden diary, Varieties and tagged pears on July 4, 2014 by JV.